Over the past two decades, great progress has been made in reducing teen use of alcohol and tobacco. Common sense regulation, coupled with education, taxation, and age and advertising restrictions, has led to the lowest rates of teen use in decades. 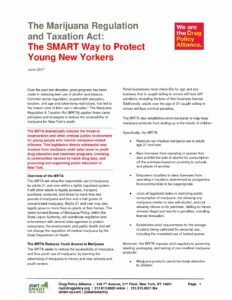 The Marijuana Regulation & Taxation Act (MRTA) applies these same principles and strategies to reduce the accessibility of marijuana for New York’s youth. The MRTA dramatically reduces the threat of incarceration and other criminal justice involvement for young people who commit marijuana-related offenses. This legislation directs substantial new revenue from marijuana retail sales taxes to youth drug education and treatment programs, investing in communities harmed by harsh drug laws, and protecting and supporting public education in New York.